Being parent to a toddler is many things. It is wonderful. Exciting. Exhausting. Rewarding. A full mixture of emotions and challenges, meaning that no day is ever dull. And who would want it any other way? But in this modern culture of busyness and fast living, we constantly find ourselves juggling work, family, cleaning, cooking and all the rest of it, often at the expense of other, equally as important commitments. We don’t always get time to step back and consider other important elements, such as the happiness and well-being of our family and, most importantly, our children. Our little ones need to know that they are special, and its up to us to tell them! Are we literally losing touch with our children? Introducing positive touch into your toddler’s daily routine is not as hard as you might think. We’re huge advocates of baby massage but there’s no need for it to end once baby becomes a toddler! Massage is hugely beneficial for people of all ages; we all love to be touched, and a massage is a wonderful way to project feelings of love onto another person. Studies have shown that receiving a massage can help to boost the immune system, ease stresses and strains, and help to maintain a positive outlook on life. Why would we not want that for our toddlers? We don’t all have personal masseurs to hand, unfortunately, but rest assured that you yourself are more than able to give your child a massage. There’s no reason at all why it can’t become a wonderful part of your daily routine for many years. If you’re still not sure, it might help you to know that studies have found many benefits to the toddler massage, and the power of nurturing touch is definitely not to be underestimated. Tiffany Field’s study at the Touch Institute in Miami discovered that children who received regular massages had better sleep patterns, lower anxiety levels and less stress hormones in their bodies. These children also had an improved cognitive performance when examined too. In addition, emotional regulation and self soothing in toddlers is improved through massage, and parents are really able to connect with their children as a result. It’s worth noting that regular massage can also help to ease symptoms of minor childhood ailments, such as headaches, constipation and teething pain. • Using stories and songs into your routine. Songs such as Incy Wincy Spider, This Little Piggy or Twinkle Twinkle Little Star are great for gentle massage strokes and you can draw out the actions with your hands. 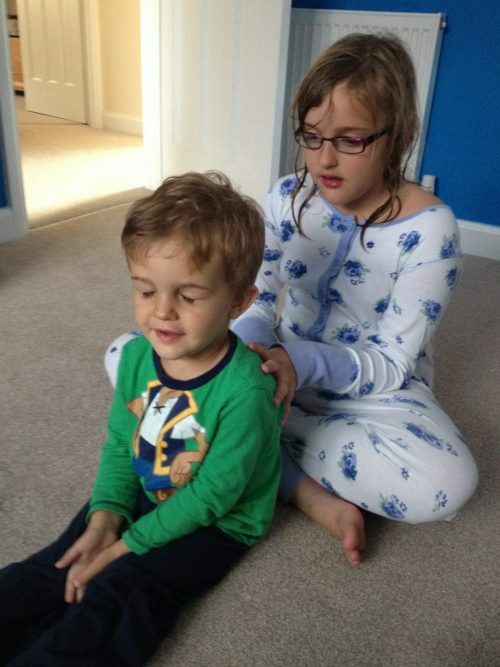 • Ask your toddler where he/ she would like their massage; give them control of the whole thing. This will give them positive physical boundaries and help to empower them in their own bodies. It will also help to build and maintain a relationship of trust too. • Soothing. As already mentioned, a toddler’s life can be frustrating, and not only for the toddler! A relaxing massage can be just the way to unwind at the end of the day for both parent and child. • Bonding. In our busy lives, we don’t always take much time to really connect with our families, and when you have a toddler it can be even more difficult. Massage is the perfect way to strengthen the bond between parent and demanding toddler. • Stimulation. Massage aids digestion, stimulates the nervous and immune systems and helps the blood to circulate freely around the body. It also helps to improve skin suppleness and texture. • Sleep. Massage helps to relax and soothe, and promotes better and longer sleep. • Respiratory. Massage aids the circulatory system, allowing more oxygen and nutrients to flow around the body. This oxygen uptake also strengthens the the immune system. • Internal organs are stimulated during a massage, which helps to promote their growth. • Infections are reduced as the flow of lymphatic fluid is increased, thus leading to a natural resistance to illness. • Growth is improved as hormones from the pituitary gland are increased. • Movement. Massage helps to allow the body’s muscles to relax, which means that the joints can move freely. This can release stress and tension in the body and encourages muscular relaxation and joint flexibility. • Relaxation is not always easy when you’re a toddler, but massage helps to teach essential skills of becoming calm and listening to the body, especially in times of stress. This can help with aggressive or hyperactive behaviour and improves physical and mental energy levels- which in turns encourages alertness, concentration and feelings of well-being. • Motor development is improved. • Cognitive development is improved. • Choose your time. At the end of a busy day, before bed, is the probably the best time for a massage, but you will know this best. Massage helps to raise levels of oxytocin in the body, which aids sleep and therefore helps to relax before bed. • Keep it familiar. Choose a location in your home and stick to it. Let your toddler know what to expect every step of the way. The bedroom is ideal, as it helps to promote a feeling of well-being that will be associated to both massage and bed time. • Comfort. You want your toddler to be as comfortable as possible so make sure the room is warm as your child will be partially undressed. Also make sure that your toddler is resting on a soft surface, such as a blanket or towel. • Calm. Keep the massage session as calm and relaxing as possible. Dim the lights, play soft music- whatever you need to do to create the right atmosphere. • Choosing a massage oil. If you’re using a massage oil, choose it carefully and keep in mind sensitive skin or allergies. Avoid nut oils and be aware that some toddlers will most likely end up with oil on their hands and probably also in their mouths! Mineral oils are also best avoided as they are not easily absorbed by the skin and can leave your toddler slippery and greasy. The best oil to use is an organic, unrefined vegetable, avocado or grapeseed oil. Always carry out a patch test before you massage your toddler, to eliminate any adverse reactions to the oil. • Positioning is important for both you and your toddler. Make sure that your back is supported in a chair, or if you’re sitting on the floor make sure that you support your back with some pillows propped against a wall or similar. • Either of you are unwell. Wait until you’re feeling better, otherwise the positive associations you’ve built up so carefully could be compromised for you both. • Fever. Children with high temperatures should not be massaged, as the heart rate can be decreased by a massage. Wait until the fever has passed. • Tummy upsets can be worsened if the stomach is stimulated, and your toddler will probably also experience discomfort. • Rashes or lesions on the skin need to be assessed by a doctor before you massage. • Immunisations can delay a massage too. Wait at least 48 hours after injections so that the medicine can be absorbed by the body at the correct rate. Toddler massage can be a wonderful way to regain precious connections with your child, and when you consider the benefits that can be reaped, it’s a wonder why more families don’t use it as part of their daily routine. So, what are you waiting for? Previous PostPrevious Using essential oils safely in pregnancy and beyond.